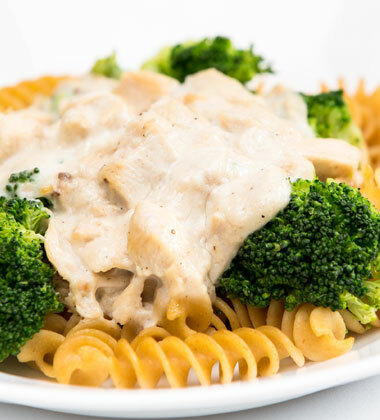 This classic Alfredo dish is transformed by combining Campbell's® Healthy Request® Condensed Cream of Mushroom Soup, chicken, whole grain pasta, broccoli, and Parmesan cheese. Creamy and delicious, it's sure to please any patron. 1. Cook pasta until al dente. DO NOT OVERCOOK. Drain well. CCP: Hold hot at 140°F or higher. 2. In a stockpot or steam-jacketed kettle add the frozen broccoli to boiling water. Bring water to boil, reduce temperature. Cover and simmer for 5 to 10 minutes. Drain. In place a single layer of frozen broccoli in a steamer pan. Steam uncovered for 3 to 5 minutes. Drain. CCP: Hold at 140°F or higher. black pepper, ground	 1 tbsp. 3. To make sauce, combine soup, milk, pepper, garlic, cheese, and chicken. Cook over medium heat for 5 to 10 minutes,stirring often. CCP: Heat to 165°F for at least 15 seconds. Combine cooked pasta, broccoli, and sauce. Transfer combined mixture to serving pans. 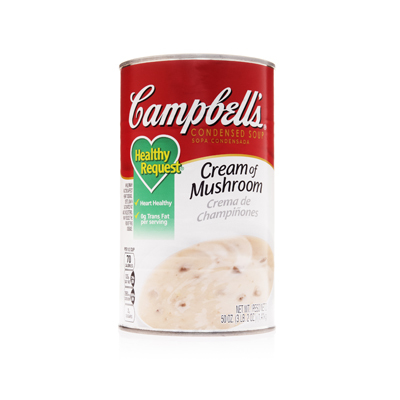 Portion size = 1 ½ cups (two 6 fl oz spoodles). CCP: Hold for hot service at 140°F or higher. Thaw chicken in the refrigerator in advance of preparation. Cook frozen vegetables only until tender but crisp; they will become overcooked when held too long on a hot steam table or in a holding cabinet. If served as a mixed dish, keep pasta, sauce, and broccoli separated and combine just before serving time to maintain best product consistency. If pasta is prepared in advance of the day of service, follow directions for cooking pasta for same day service. After it’s cooked and drained, return the pasta to the vessel and cover it with cold water. Add ice, stir gently, and chill the pasta to 40°F or below. Skim off any remaining ice with a strainer, and drain. Store in covered containers, refrigerated at 40°F. To reheat, place pasta in a basket or strainer and plunge into rapidly boiling water. Drain hold for hot service at 140°F or higher.